Some last, LAST last, last minute kid gifts for the holidays. I know you’re out there: the procrastinators, the mamas, the aunties and uncles, the dads and godmothers, godparents among you. I’ve got a seriously very last-minute gift guide for kids for the holidays, with a little something for everyone and every age. 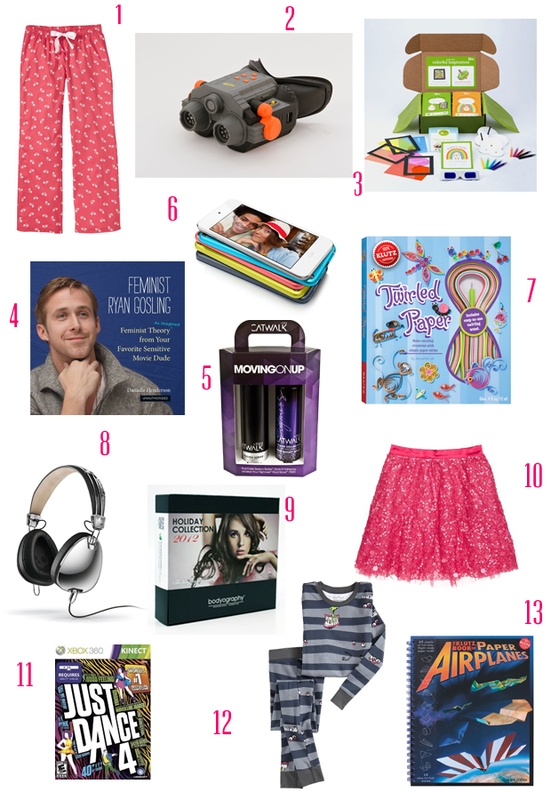 Pajamas for the kids, night goggles to spy Santa, craft kits, craft books, a Ryan Gosling book for the budding feminists among you (by my amaaaaazingly gifted and super wicked smaht friend and scholar Danielle Henderson), makeup (for the way older teen girl), and the newest Just Dance 4 video game for everyone. Wait till grandpa gets in on that action, it will be a Merry Christmukkah Festivus miracle for all. << What can you wear to a holiday party?